Write a C# Sharp program to create a new string from two given string one is shorter and another is longer. 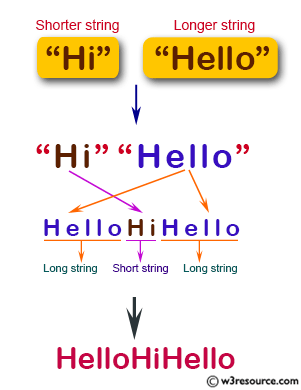 The format of the new string will be long string + short string + long string. Previous: Write a C# Sharp program to create a new string without the first and last character of a given string of length atleast two. Next: Write a C# Sharp program to concate two given string of length atleast 1, after removing their first character.